You will see on the ‘Notice’ from BC Hydro a key element. It says ‘Contact’ as in ‘You must contact BC Hydro at 1-800-409-8199’ As we are sure you are used to by now, this is yet another trick for them to make you think you MUST call them, but that is not the case it says clearly CONTACT and thus you can do so by mail. There is no need or reason to call them. DO NOT CALL THEM. If you are seeing other groups, letters, etc. saying to CALL them… do not. You will also see they keep repeating “It is our equipment” in more or less words, and, if you have done a claim to which they have not disputed, it is not, so here you can see they are trying to make it so you think (despite all you have done) that it is their meter… which it is not. There are some out there that may be saying ‘they are only wanting to switch an analogue meter with an analogue meter… what’s the big deal, this is a victory for us, let’s take it and run’ FALSE. Their objective is to take OWNERSHIP of your meter which you have a Claim to. They want to end that claim. This is just tricks to get you to let your guard down, don’t fall for it. Just think for 2 seconds, why on earth would they go through all the trouble to put on what is likely an older meter (likely taken from Fortis BC area) given a shine and prepped for you, when, you could simply just keep your meter that you have now? It is obvious something is up. This is easily understood by the language of the document itself as well as the fact that out in the field, they are not taking ‘new analogue’ meters to peoples houses. They are using multi-decade old meters to replace the ‘expired’ meters (many of which are decades newer than the replacement) so this is not about an ‘exchange’ but something much bigger. How does a blue, red, yellow… whatever tag on a meter make the mechanics Inside the meter any different? It doesn’t. It is all just desperate tricks, which was the whole point of the ‘meter expiry’ as they keep going on and on with new ‘tricks’ (offers to contract) Clean Energy Act, Meter Choices Program, Meter Expiry and so on (with many notices and offers in between). This is their trick to not only take a meter they have registered into the Meter Choices Program (MCP) which puts you in that program but to also get you to take a new meter NUMBER, which changes your account, your contract and is most likely their way of trying to nullify all your previous hard work and document sending to get you into a new contract. We have made a very simple document for you to send off back to the Address at the bottom of the page that BC Hydro sent you. And if it is 1, 2, 3 notices… that’s ok too. For now, you must rebut (see contact above) or BC Hydro will assume you agree to the terms of either losing ownership of your current meter (see ending your claim of right) or agreeing that they can cut your power. This is NOT a disconnection ‘notice’ this is a notice for you to ‘CONTACT’ them. 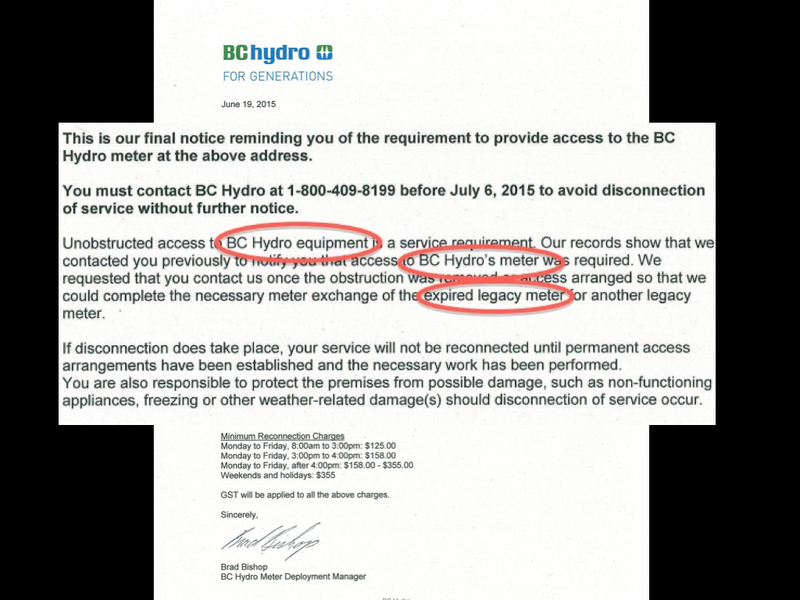 Which again is why we cannot understand why people are saying ‘let them swap the meter for a new analogue’ when of course we know this is NOT a new ‘analogue’ but is clearly stated, by BC Hydro, in the notice sent that this will be called a LEGACY METER. In the ‘physical’ world, yes, they are the same thing but in the game that BC Hydro is trying to play it is a totally separate entity altogether. 3) APPLY REGISTERED MAIL SMALL NUMBER STICKER ALONG SIDE OF LETTER. 4) GET THIS REGISTERED MAIL SMALL STICKER DATE STAMPED BY POST OFFICE WORKER IF POSSIBLE. 7) KEEP THE PHOTOCOPY FOR YOUR RECORDS. REBUTTAL DOCUMENT-REBUTTAL DOCUMENT- YOU ARE SENDING THE PHOTOCOPY. KEEPING THE WET INK COPY. BCH ENVELOPE (THAT THEIR NOTICE CAME IN)- GOES IN WITH THE 2 ABOVE DOCUMENTS IN THE REGISTERED MAIL ENVELOPE MAKE PHOTOCOPY IF POSSIBLE OF ENVELOPE AFTER PRINTING IN RED INK ON IT IF YOU DID NOT KEEP YOUR ENVELOPE THAT IS OK.
Below is the same document, it is just in two formats, Mircrosoft Word OR PDF, whichever is better for your computer. AUTHORIZED SIGNATURE IS… YOUR SIGNATURE. WHEN PRINTING YOUR NAME IN THE NAME RECTANGLE, PRINT NAME IN FULL, NO ABBREVIATIONS (‘John’ IS NOT PRINTED ‘J.’ etc. A witness is always preferable, but we understand it is a bit of a time crunch. If you can get a witness Write: Witness (make rectangle same as for your name, yes, can be in ink) and then Authorized Representative done the same as where you have done your name/signature. (There are technically 2 smaller stickers on the large sticker you will be writing BC Hydro’s address on. One will peel off, the other you will have to use a sharp object to cut out. DO NOT USE scissors and make a hole) These smaller STICKERS are just above the BAR CODE. 2) ASK POST OFFICE PERSONNEL TO DATE STAMP THE REBUTTAL FORM. 5) STAPLE TOGETHER BCH ORIGINAL LETTER AND YOUR WET INK COPY OF THE COMPLETED AND SIGNED AND WITNESSED REBUTTAL NOTICE. When Filling in your return address on the Registered Mail Sticker Full Name (Upper and Lower case as above) NO ABBREVIATIONS for street (st.) Road (rd.) etc. DO NOT INCLUDE POSTAL CODE EITHER. FOR BC HYDRO ADDRESS, IF THERE IS A DIFFERENCE BETWEEN THE ADDRESS ON THEIR ENVELOPE TO YOU AND THE NOTICE THAT WAS IN IT USE THE ADDRESS AT BOTTOM OF NOTICE THEY SENT YOUFOR PRINTING THEIR ADDRESS ON THE REGISTERED MAIL STICKER, USE ALL CAPITALS AND POSTAL CODE AS IS ON THE NOTICE THEY SENT YOU. This should work on your computer if you have word and adobe etc. Please do not email us with issues with your own personal computer, we don’t have time to troubleshoot your computer. If for any reason it does not open, go to your library, use a friends computer, make sure you have applicable software etc. The Disconnect Notice Rebuttal is in Microsoft Word AND PDF Format which is very universal to everyone. If you cannot find it, make sure you check where documents download to on your computer. Thanks!